Does the Prosperity Gospel make you generous? Think the “prosperity gospel” movement ended when The Prayer of Jabez dropped off the bestseller lists? Think again. The prosperity gospel remains one of the fastest growing and most prominent religious movements among U.S. Christians and is extremely popular internationally. It shapes many of the largest churches in the world, from South Korea to South Africa. Also known as the “health and wealth gospel,” it is the doctrine that God wants followers to prosper. Through naming and claiming their hope for health and wealth, adherents confess they can achieve physical well-being and material success through faith in God and their tithes or financial contributions to the church. The view is espoused from local neighborhood pastors to televangelists from Joel Osteen to Creflo Dollar and Paula White. While viewed by some as “edgy” or “unchristian,” its popularity warrants greater understanding. 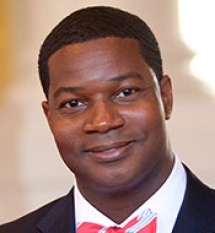 One of America’s foremost experts on the prosperity gospel, Jonathan Walton, will present Lake Institute on Faith & Giving’s 2016 Thomas H. Lake Lecture on March 31 in Indianapolis. Walton is the Plummer Professor of Christian Morals, the Pusey Minister in the Memorial Church, and Professor of Religion and Society at Harvard Divinity School. In his remarks, “Jesus, Chief Executive: The Gospel of Health & Wealth at the Core of American Religion,” Walton will explain how its popularity makes sense in light of both the ascent of the mega-wealthy in a new Gilded Age and of the slow economic recovery experienced by many Americans in the post-recession era. Walton will explore the rise of the prosperity gospel, its current status and why it is appealing. He will discuss how American Protestantism and capitalism have maintained an interdependent relationship throughout history, how the prosperity gospel is tied to the American ideologies of rugged individualism and upward social mobility, and how it shapes Christians’ understanding of their religion. The lecture will begin at 4:30 pm, followed by a reception at 6:00 pm. Both events will be held at the Indiana Historical Society’s Eugene and Marilyn Glick Indiana History Center, 450 West Ohio Street in Indianapolis. A social ethicist and scholar of American religions, Walton’s research addresses the intersections of religion, politics and media culture. He is the author of Watch This! The Ethics and Aesthetics of Black Televangelism. Walton earned his Ph.D. in Religion & Society and his M.Div. from Princeton Theological Seminary. He also holds a BA in Political Science from Morehouse College in Atlanta. He serves on several professional boards and committees, including the board of trustees at Princeton Theological Seminary and the national advisory board of the John C. Danforth Center on Religion & Politics at Washington University in St. Louis. Lake Institute exists to foster a greater understanding of the ways in which faith inspires and informs giving through research, education and training. The institute offers customized programs that translate data and giving trends into practical tools. Lake Institute supports the development of research designed to explore the broad context of religious giving. Through public forums Lake Institute engages practitioners, scholars and the community in thoughtful conversation and reflection. Follow us on Twitter @LakeInstitute.